Featuring Rock band Dissonant Nation with the resonating album titled We Play We Are in Their Credit, the trio from Aubagne have a dynamic style of rock performed in three languages: French, English and Marseilles. Their energy guarantees to burn the night away, and expect a vigorous yet refreshing performance. Ticket price: VND120,000 or VND60,000 for members of L'Espace and students. The New Orleans Bourbon Jazz Festival featuring music, dance, Cajun food and coolers. The event, organised by Arts for Mobility, an organisation that raises funds for charity, will feature blues and soul singer Eugene "Hideaway" Brides from New Orleans and jazz singer Shun Sakai from Tokyo. City-based artists like the Wanderlusters and The Blue Brothers will also perform. There will be jazz dance performances by the Urban Dance Group as well as belly-dance shows by the Saigon Belly Dancers. Tickets are VND500,000, including VND200,000 for food and a drink voucher. All proceeds will be donated to Kids First Vietnam to buy wheelchairs for children in Dong Ha Town in Quang Tri Province, and to help send them to school. Live entertainment show featuring talented singer Bella Bui who is known for her distinctive voice and inspiring performance. Special lucky draw: Chance to win a bottle of Champagne and many bottles of sparkling wine. ‘Keri and Friends’ is the first ever concert in Hanoi for oboe music. The concert features Dr. Keri E. Mc Carthy from the U.S.A and her oboist friends in Hanoi who are from the Vietnam National Academy of Music, the Vietnam National Symphony Orchestra, and the Vietnam National Opera Ballet. Well-known French singer Patricia Kaas will perform at a charity concert to raise funds for disadvantaged children in Vietnam. The show commemorates 50 years of popularity of iconic songs by the late French chanteuse Edith Piaf. Some of Piaf's songs that Kaas will perform include La Vie en Rose (Life in Pink), L'Hymne a l'Amour (Hymn to Love), Non, Je Ne Regrette Rien (No, I Regret Nothing), La Belle Histoire d'Amour (Beautiful Love Story) and Avec ce Soleil (With this Sun). All proceeds from the event will be used by Poussieres de Vie for projects that help disadvantaged children in Vietnam. Enjoy the unique genre’s sweet melodies by Ca Tru Thang Long trio. 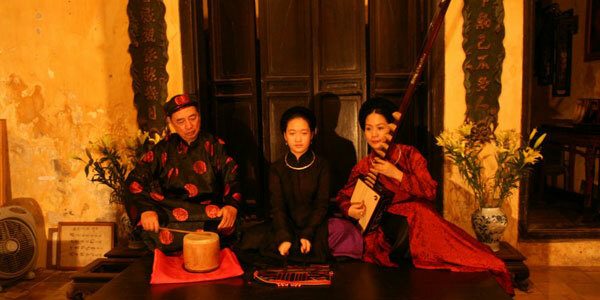 The band included 83-year-old singer Nguyen Thi Chuc, dan day (long-necked lute-like instrument with three silk strings and 10 frets) player Nguyen Phu De, 88, and their student, singer Pham Thi Hue. 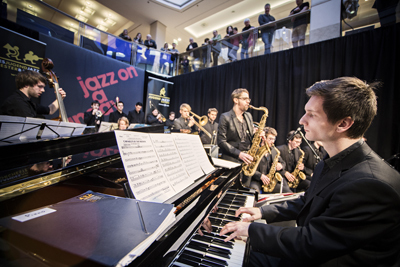 A group of the most gifted among the Bavarian Youth Jazz Band, also known as “Bavarian First Herd”, will perform a program ranging from traditional Swing by jazz greats like Count Basie or Duke Ellington to modern kinds of Bebop, Latin, Funk and Fusion compositions. The young musicians will also present some of their own arrangements and compositions. Concert at Hanoi Opera House and HCMC Opera House, free tickets can be collected at the Goethe-Institut Hanoi or Goethe-Institut HCMC. 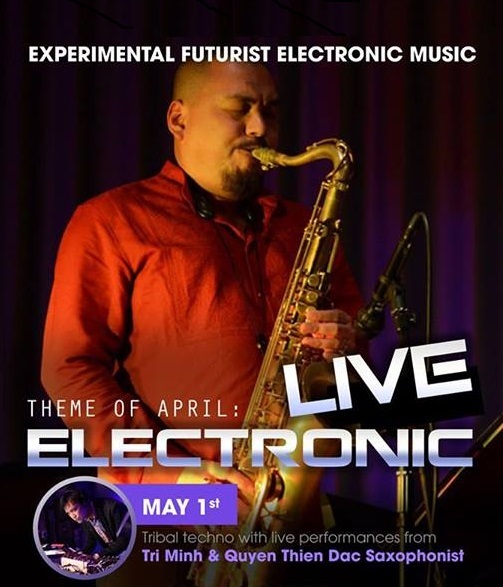 Vietnam’s famous saxophonist Quyen Thien Dac is going to have a special session with DJ Tri Minh, who has been always determined on his way of experimental electronic music. For booking, call: 04 3946 1901 – 0913 70 69 66. Performance of Haydn's oratorio, The Creation. The performance, to be directed by well-known Norwegian conductor Lars Notto Birkeland, will feature international opera singers, including soprano Cho Hae Ryong, tenor Erlend Tvinnereim, baritone Halvor F. Melien and the HCM City symphony orchestra and choir. A musical work celebrating the victory at the battle of Dien Bien Phu by French Vietnamese composer Nguyen Thien Dao will start out the concert. The 25-minute symphony has four chapters: Rong Tien (Fairy Dragon), Tinh Ca (Love Music), Thoi No Le (Slavery), and Diem Hen (Rendezvous). Two symphonies, Poem by Ernest Chausson and Beethoven's 3rd will be performed. The concert will feature musicians from the VNSO, including violin virtuoso Bui Cong Duy. “Now is when” is the title of the photographic exhibition by Suzette Mitchell on abstractions of Buddhist monks and nuns. The title is a reflection on “being in the present” which is the focus of Buddhism. The images are simple and meditative. The profits will go to the work of the Charity Organisation of Dinh Quan Pagoda. Through the work of this remarkable nun support is provided to poor cancer patients, disabled children, orphans and poor rural students coming to Hanoi to sit university entrance exams. She also makes chao (rice soup) to feed poor patients. Miguel Trillo is a famous Spanish photographer who makes portrait about young urban people around the world in the last 40 years. In this exhibition, he will show the portraits of people of HANOI and SAIGON. An exhibition focusing on the process of reinterpretation and the change of artwork when adapting to new environments. The idea is based on the concept of immigrant and contemporary lifestyle. New fresh experience is a strong incentive which brings up the awareness and consciousness of our true self under the cover of our root culture. It reveals our substance of perspective of life. These situations also give the artists an opportunity to rethink and redesign their work (or even themselves). The process starts with an unfinished artwork which travels along with an artist from his hometown to an exhibit space in a different place. During the time the artist is required to absorb, learn and reinterpret the new environment and allow it to influence his work. An exhibition by Dutch and Vietnamese artists, featuring works in abstract, figurative and installation art. Organized by the Embassy of the Republic of Poland on the occasion of the 10th Anniversary of Poland’s accession to the EU. Marek Wysoczynski, the initiator of the unique Project Smile has been collecting autographs of renown personalities in Poland and all over the world for many years. 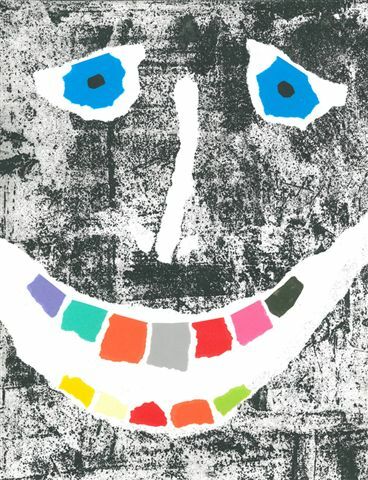 Numerous celebrities such as Jim Carrey, Michael Jackson, Diego Maradona have donated to the project their smile autographs. These “smiles” have been demonstrated in different countries. During the trip to Vietnam, in addition to the Exhibition, Marek Wysoczyñski will also visit the children at SOS Children’s Village to smile with them and together draw their own smiles. More information about the Project Smile can be found at: www.promocjakultury.pl. HCM City Fine Arts Association's headquarters, 218A Pasteur Street, D.3. An exhibition of paintings and sculptures by 52 well-known HCM City artists. Proceeds from the sales will be given to the Buddhism Today Charity Fund to assist cancer patients. On display are 59 works in oil, lacquer and wood, reflecting a wide range of topics, covering daily life, landscapes, people, lotus flowers and still life. A variety of local and international delicacies that are handcrafted by their culinary team. For the first time ever, this May enjoy the local seafood market concept blended with sumptuous buffet dinner. Fresh seafood corner, including lobster, oyster, sea bass and salmon. Pick your favorite and watch as their team prepares your delectable dishes. Starters: Lotus root soup with chicken fillet; Fresh shrimp & pork spring rolls; Crispy shrimp pan cake. Mains: Grilled chicken fillet with lemongrass & steamed rice; Stir fried squid with pineapple & steamed rice; Seafood fried rice. Desserts: Cream caramel; Apple tart; Yogurt with honey. 2 courses VND190,000 & 3 courses VND290,000. With selection of grilled beef, chicken, lamb or sea food such as shrimp, fish, squid or vegetables, salad bar and dessert. - 25% dinner discount on food and beverage for Accor Advantage Plus members with groups of 5-10 people, every Monday and Tuesday. Annual event featuring circus performances, comedies, a painting exhibition, an Aerobic contest, and games. “I love history” club will launch activities to help kids enthusiastically learn about the national history and defence cause. Featuring more than 100 local dishes. The unique cuisine of the Central Highlands will be the highlight of the event. More than 100 booths will display dishes from the central province of Thua Thien-Hue to the southern tip of the country. The fair will include demonstrations of cooking and bartending as well as the art of food garnishing and vegetable and fruit carving. Demonstrations of the gong culture in the Central Highlands, along with southern traditional music and traditional folk games, will be part of the event as well. - Approximately 100 booths with different handmade and vintage products: clothes, accessories, dream catcher, etc. - Unique services: Henna Tattoo, Tarot Reading, braiding hair, …. A live Jazz performance by outstanding German artist Bavaria, under the baton of Harald Ruschenbaum on May 9 in Hanoi and May 11 in HCMC. Talented violinist Alicja Smietana from Poland will take to the stage in Hanoi on May 28. The European Film Festival showcasing 14 award winning movies in Hanoi, Danang and HCM City on May 16-17-18, respectively. A photo exhibition on Hanoi and a short film competition themed energy conservation. A number of seminars on European culture and the importance of Vietnam-EU relations in Hanoi and HCM City. An overnight camp called "SO Camping: Into the Wild" will include a bonfire, a BBQ, s'mores (marshmallow/chocolate sweets roasted over an open fire), an acoustic guitar performance, a pyjama party, ghost stories, campfire songs and games. Participants are asked to bring a mosquito net. Over 200 amateur cyclists will race from the beach road to finish at the top of Son Tra Mountain on the opening day. Beach volleyball, kayaking, coracle wagging, net fishing, and hip-hop contests will be held on May Day. Three DJs, windy Quyen, Ngoc Anh, Nhunk, and some rock bands are slated to perform at the night beach party in the Dana beach entertainment centre on May 1-3.